For me, knowing what foods can be eaten in the wild isn’t just about survival. It is about self-sufficiency and having a connection with nature. There is nothing tastier than eating a meal which you found and prepared all on your own! I do NOT recommend that you start memorizing massive lists of edible plants and ways to make animal snares. 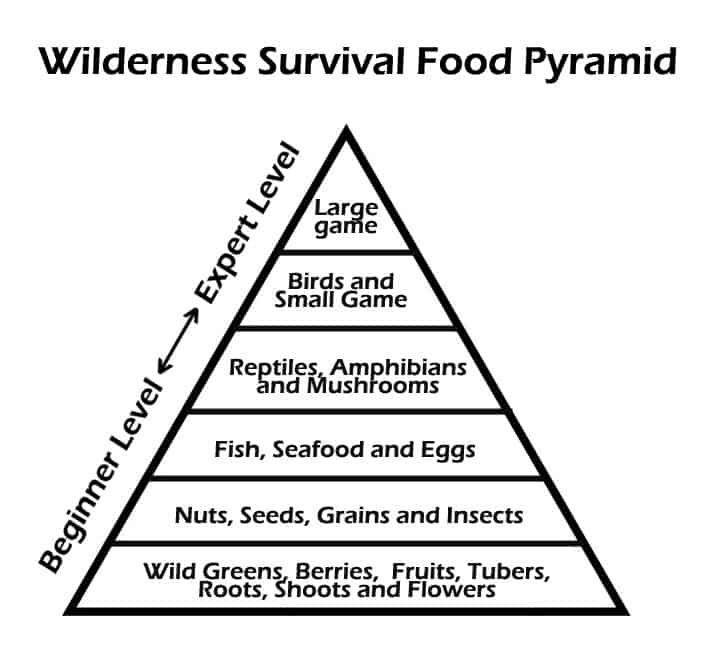 The Wilderness Food Pyramid isn’t about what you should eat. Rather, it shows you what foods you should learn to eat available based on your skill level. When you are first starting out with wilderness survival, you will be eating foods which don’t move fast or at all. Examples of these are wild edible plants, and insects as survival food. As you start getting more comfortable in the wild, you can work your way up to small game and fish. With the right knowledge, these can be caught with traps and snares. You’ll note that wild mushrooms are higher up in the pyramid. 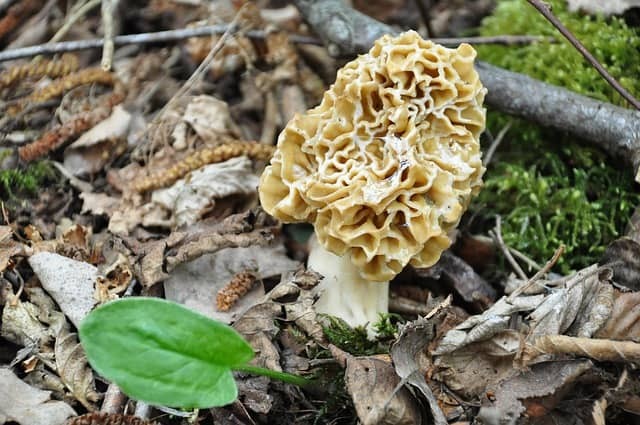 This is because, even though mushrooms won’t run away from you so are easy to forage, it requires a lot of knowledge to properly identify mushrooms. 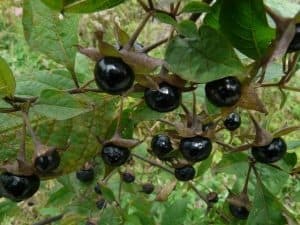 A lot of edible varieties resemble poisonous ones! As you reach a more expert level, you will start eating larger game like deer and elk. These not only require skill to kill (particularly patience! ), but skills in preparing and preserving the meat. 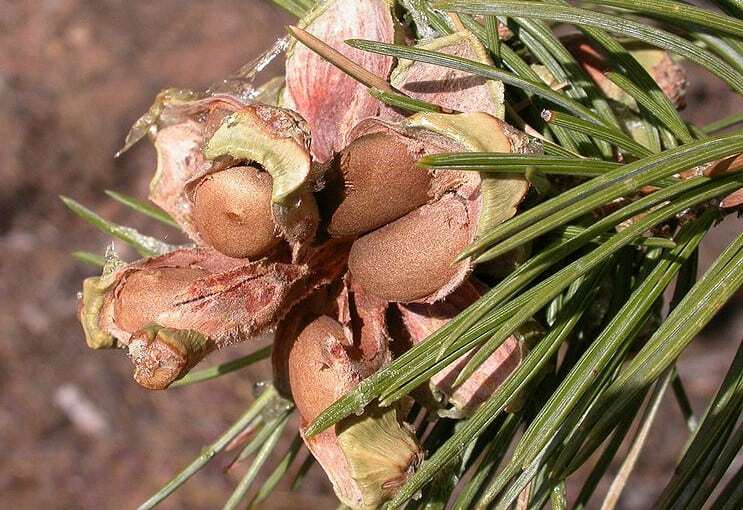 These are some of the easiest wilderness survival foods to find. I suggest that you get a good field guide for your area and start going on some hikes to forage for foods. 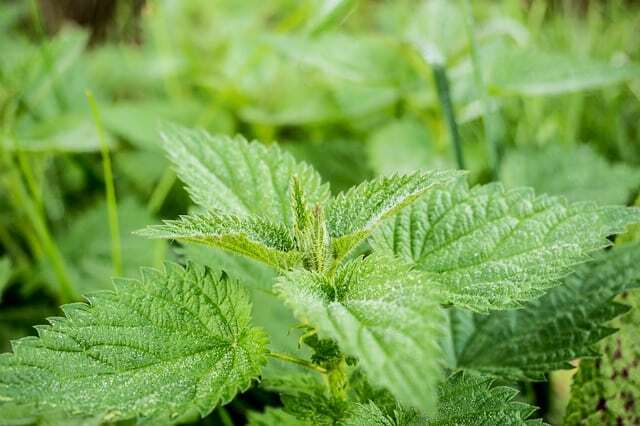 It is fun and you’ll get some practice in at identifying wild edible plants. These fall a bit higher on the wilderness survival foods pyramid because they aren’t always easy to access. For example, you may need to climb trees in order to get some nuts before critters like squirrels do. 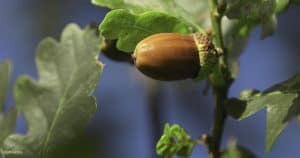 Some nuts, such as acorns, also need to be soaked in water before consumed to get rid of the tannins. Eating wild grains takes a bit more knowledge. In many cases, you can just chew on wild grasses to get their nutritious juices and then spit out the indigestible fiber. To use the seeds to make grains, you’ll have to harvest them and then grind them up. 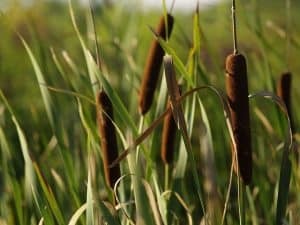 Outdoor Life has a good article on wild grains that you can check out. Also, this forum has some good responses on how to make flour from wild grains. It is really annoying how eating insects has been stigmatized as gross. 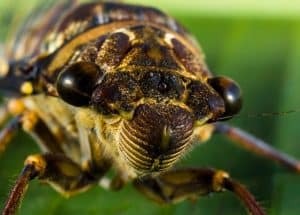 In many countries eating insects is considered completely normal — as it should be considered since insects are so nutritious! Unfortunately, most of the time when we see people eating insects, it is on some hyped-up reality TV show like Bear Grylls or Survivor. You should NEVER just chomp the head off of a live insect!!! Just like with meat, insects should always be cooked to kill any parasites which may be in them before eating. There are a lot of edible insects. Crickets and grasshoppers are my favorite (though ants are also pretty tasty). 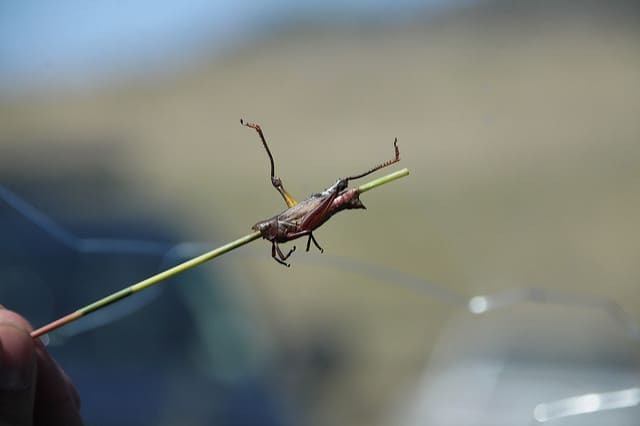 Here is a guide on how to roast grasshoppers. Forget what you’ve seen in the movies! Catching a fish with your bare hands or even with a spear requires a lot of skill. However, it is fairly easy to make a fish trap. See these examples of how to make a survival fish trap. You can even just set the trap and forget about it until the next day. How easy is that! Near the ocean, there are also other types of animals you can trap. 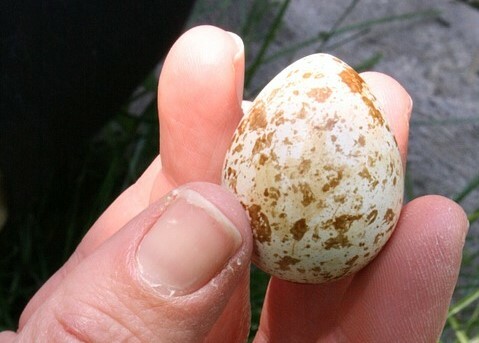 As for eating eggs, this is fairly easy in the right season – assuming that you are capable of climbing a tree! 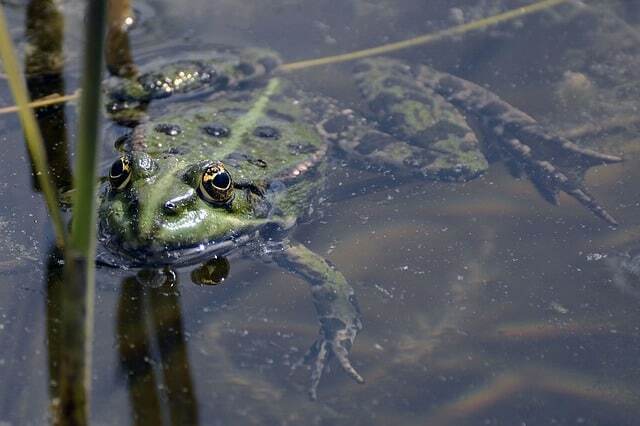 Amphibians can often be caught with your bare hands in lakes, streams, or other smaller bodies of water. You can also make traps for catching them. Lizards are a bit harder to catch because they move so quickly and can hide in small crevices. However, lizards are all over the place so you’ve got a good chance of getting one if you set a trap. Mushrooms are a great survival food, but you’ve really got to be cautious about eating them. There are many edible mushrooms which resemble poisonous ones. Even if you don’t get killed by eating the wrong type of mushroom, you could end up with diarrhea – and that might kill you out of dehydration! In other words, don’t take any chances. Eat foods lower on the survival pyramid and work your way up to mushrooms. Preferably you start foraging wild mushrooms with an experienced guide. NEVER use social media or online sites (except very reputable ones) to identify mushrooms. If you want a good guide to snares and traps, I recommend checking out this page. 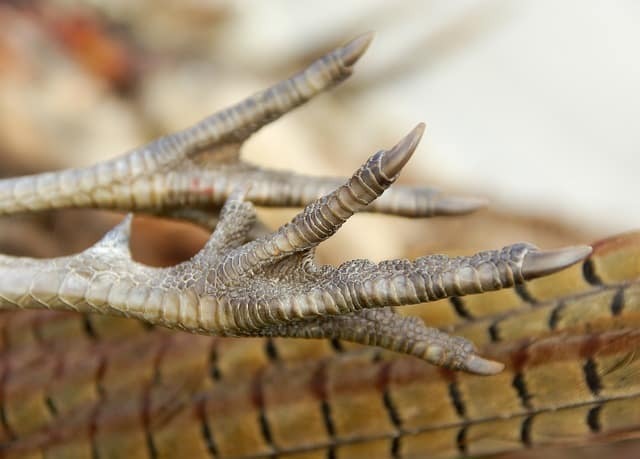 We go over some basic traps for catching birds and other small game. If you are patient enough and have a rifle and are a decent shot, hunting large game doesn’t require that much skill. 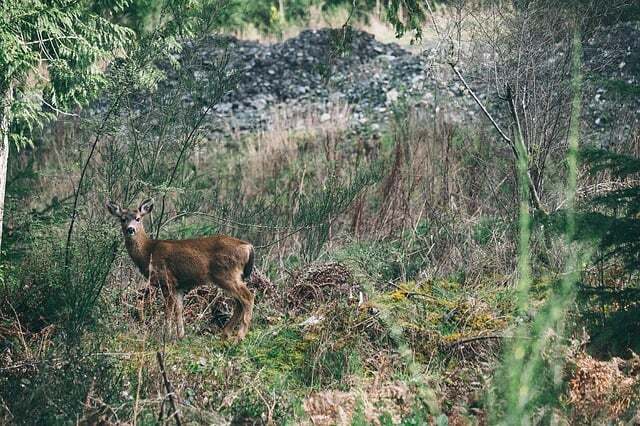 But, since we are talking about a SHTF survival situation here, you might not be able to hunt with a rifle. The sound could draw attention to your location. Hunting with silent weapons like spears and bows and arrows is not so easy! You will need a much higher level of skills for this wilderness survival food. There is a lot more to hunting large game for survival than just killing it! Unless you want all of your meat to go to waste, you better know how to preserve it. Again, this takes skill knowledge and practice. Here is a good video showing you how to preserve meat in the wild. 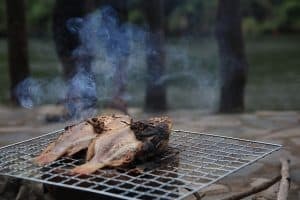 What foods have you eaten in the wild? Do you agree with the level of skill required for each of these types of survival food? Let us know in the comments.